FOREST CITY, IA--(Marketwire - May 13, 2008) - Winnebago Industries, Inc. (NYSE: WGO) celebrates its 50th anniversary with the introduction of the exciting, new 2009 Winnebago, Itasca and ERA brand motor homes during the Company's Dealer Days event held May 12-15, 2008, at The Mirage in Las Vegas, Nev. With a theme of "50 Years on the Road," Winnebago Industries displayed 50 motor homes representing key elements of the Company's 23 model lines and 78 floorplans, 46 percent of which are new or redesigned for 2009. Winnebago -- The Winnebago Adventurer has been merged with the Voyage product line to create an exciting new Class A gas coach. Redesigned for 2009, the Adventurer features new floorplans that include a new full-wall slide 32H, a spacious triple slide 35A, double slide 38N and a new triple slide 35Z featuring a unique optional wardrobe with bunk beds. Attractive wardrobe doors open fully to reveal the beds that fold down when in use. When the bunk beds aren't in use, the flexible space can be utilized for storing clothing, bedding, or your latest souvenirs. 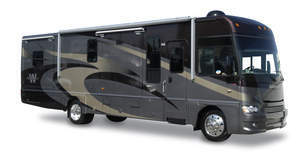 Itasca -- The popular Itasca Suncruiser Class A gas motor home has also been redesigned for 2009 and has a unique double-slide 35L, new full-wall slide 32H and 35P, as well as a roomy 38T. It has merged with the Sunrise line to create a well featured line of coaches at a great value. New features -- A myriad of new features make Winnebago Industries' 2009 motor homes stand out against the competition. take your Alpine GPS unit along in your tow vehicle. receiver for use in their car. converts to dual twin beds. Jim Wagner, general manager of Itasca dealer, Village RV, Roseville, CA, said, "I'm impressed with the brand differentiation between their new 2009 Winnebago and Itasca lines. They promised to deliver 'brand exclusive' products to help us drive sales in our market, and they've delivered a home run, particularly with the new Suncruiser motor home. The 35P floorplan is a hit just waiting to happen." "It's very obvious from the new 2009 products we've seen at this event that Winnebago Industries is serious about increasing their presence in the diesel market, particularly with the positive impact we anticipate from the new Meridian and Latitude lines," said Brad Fisher, sales manager of Itasca dealer, Guaranty RV Centers, Junction City, OR. "I was extremely pleased to see the great values represented by Winnebago Industries' new 2009 product line, particularly in the new Winnebago Adventurer lineup," said Will Jarnot, general manager of Winnebago and Itasca dealer, PleasureLand Inc., St. Cloud, MN. of their excellence in sales and service satisfaction. the country as well as overall top sales.